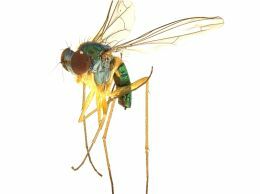 The flies from the Dolichopodidae family are small to minute in size with bright metallic colours, mostly green or bronze. Their legs are long so they have the common name Long-legged Flies. Adult Long-legged flies feed on smaller soft bodied insects, such as aphids. The total number of tasks for this dataset is: 2026, number transcribed is 2026 and number validated is 1998. Click to view records for the Australian Museum Long-legged Flies Expedition - 1 resource.